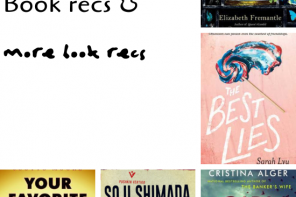 So, it’s been an epic week for bestseller lists, and how they — or the NYT one in particular — can be messed with. I’ve been posting about it, and discussing it with a friend of mine in the US, who is a budding author and we’re both gobsmacked at how Handbook for Mortals got this far into publication. It’s still annoying me immensely. Bah. How cool is this cover? I should actually point out that I am talking about A Song for Quiet. Interestingly, this seems to be written from an entirely different POV than our hero from book one, John Persons, PI and ancient and mythical entity — Deacon James is a musician plagued by visions and nightmares, which John says comes from the alien in his head. The same aliens from book 1 that John is now hunting it seems. Naturally, Deacon thinks John is nuts, which rightly so, but then his music calls beings from across dimensions, and Deacon goes on the run again. That’s when he meets a young girl, who carries something within her too and together, they are off to find something lurking in the woods… as you do. I don’t know anything about these woods, except they’re woods (as they usually are in these books lol). From the end of the blurb, I suspect this is one of those series that you need to get into from book 1. It’s very mysterious of course, but I am intrigued that this is from the POV of a man possessed by the alien instead of the PI hunting them. Kerfuffle. I like this word. Do you guys have this word wherever you are? Definition: A commotion or fuss, especially one caused by conflicting views. And nothing starts a kerfuffle like letters to an editor of a local newspaper, like the ones that inspired this book. Set in 2006, this is about just how rattled and asinine suburban Australia can get when a Maori family movies into No 14 Dunlop Crescent. Rumours spread like wildfire, including that they’re Middle Eastern terrorists who plan to turn their house to face Mecca. And from there, all bets are off, as the neighbourhood, media and anti-terrorist police and a gang of white supremacists get involved. And somehow, Gordon a retired widower is at the centre of it all. I think this sort of satire sounds hilarious and I’m certain there are suburbs around the world just like this one. Yup, Sherlock came to Australia. Or to be clear, Australian authors take Sherlock and Watson across the land down under in 1890, solving crimes and leaving their mark on Australia. Heh. I’m all over this! Family, crime and secrets. And con women. Woman, namely Amanda. After two years she’s let out of prison and wants to a nice boring life with her daughter. Except, as a con, there aren’t a lot of options to get a good job that’s going to fund her nice boring life. And then there’s her boss at the store at which she works who wants her to be his partner in crime in stealing from their employer, and then there’s the FBI who wants her to get information on her mother and her boyfriend who are smuggling arms to a cartel. And THEN there’s her daughter Taylor, who happen to very much be her mother’s daughter. There’s so much happening in this blurb, but that it’s focused on a (con artist) family is what grabbed my attention. And also it sounds FUNNY. And that’s where I’m going to leave things, because time got away from me, and I ended up going to a Crime Book Festival, appropriately called BAD, heh. It’s the first of its kind in Sydney, and I was thrilled that there was actually a festival about a popular genre like mystery and crime! I am going to follow your gran’s lead and kerfuffle my way around everything as much as possible! It rolls off the tongue so well! Well done, I can’t stop saying Kerfuffle now, LOL! Heh, it is quite an addictive word isn’t it? The festival was great for the very first one! 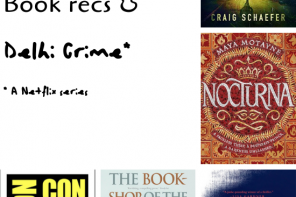 Lots of focus of Sydney and crime, rather than books based in Sydney, which was weird. I figure once people realise how popular it was, they’ll get more authors on board. Kerfuffle is kind of a fun word, you’re right lol. I was thinking that Song for Quiet had a neat cover! I like the Sherlock one too though. Beautiful Criminals does sound like a pretty fun read. I like the focus on con women. Deadly Kerfuffle sounds great too. I need to use that word more often, haha. Handbook for Mortals makes me ANGRY! 🙁 Still hard to believe. 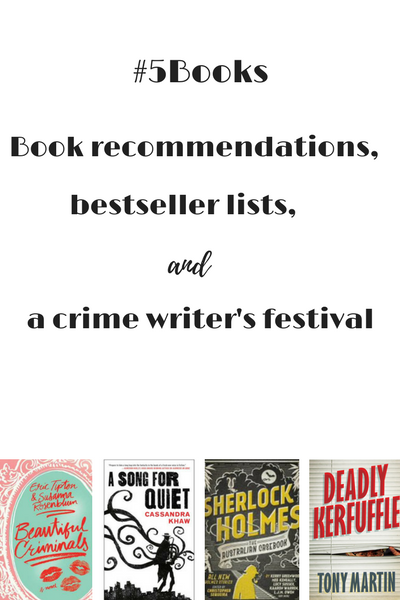 The Crime Book festival sounds good and I really hope you enjoyed it! I saw your IG post! Hope you’re having a good week V. It’s turned cold again here but I think it’s just a cold front. Last one? Maybe.. But it feels cold enough to frost overnight! I read the first book and I can’t imagine reading A Song for Quiet without doing so. I hope to pick this one up soon. I think the Sherlock Holmes one sounds interesting so I’m curious about getting my hands on it. Glad you got to attend BAD. Hope you had fun! Sherlock for sure, and then you tempt and tease me with the others! Awesome finds. The entire story around Handbook is totally bizarre and evil. Thank god for twitter detectives! Haha. I’m very intrigued by Cassandra Khaw’s books now.